At Rutgers, Theta Chi is committed to service, social, and alumni functions. Our brotherhood reflects the concept of the Assisting Hand -- that the most important duty that we have is to assist others, especially in time of need. Theta Chi Fraternity squarely meets that need. Theta Chi is for leaders; we are diverse, hard-working, successful, athletic, and scholar students, who strive to make a difference. 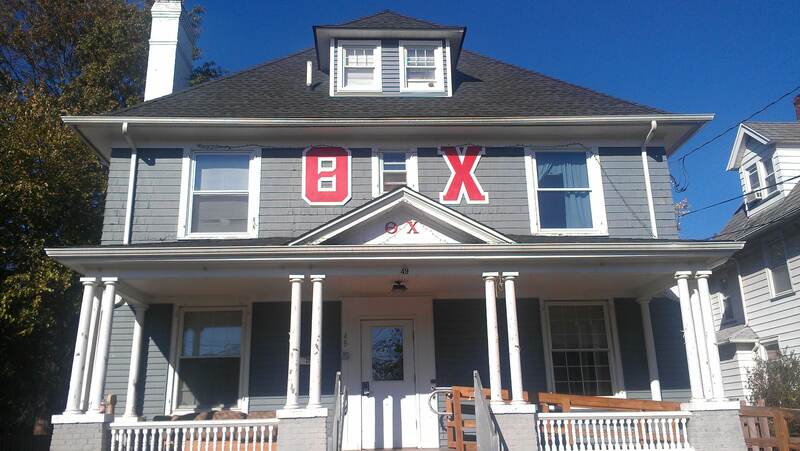 In addition to our fraternity house at 49 Mine Street, Theta Chi can be seen across all five of Rutgers’ campuses and the surrounding New Brunswick community. While being leaders and heavily involved in many organizations on campus, brothers take on hundreds of community service hours each semester. While priding ourselves in our interfraternity athletic accomplishments, we consistently maintain the highest GPA out of all fraternities at Rutgers. This past semester we finished first in overall GPA at Rutgers for fraternities and recently we earned the Howard R. Alter Jr. Award for Chapter Achievement given to the top Theta Chi chapter in the nation. While having a great year-long social calendar, we maintain a very close relationship with our alumni and other Theta Chi Chapters in the country giving us great networking opportunities that are specific only to our brotherhood.